While this Necromancer isn't the same character, their abilities seem to be in sync, as does their fashion sense. 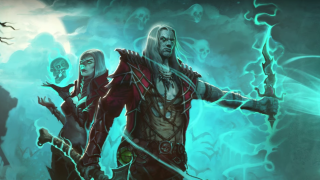 The Rise of the Necromancer pack will also include an in-game pet, two additional character slots, two additional stash tabs (on PC), a portrait frame, pennant, banner, and banner sigil. No price or release window beyond "2017" has yet been announced. It's been interesting to watch the development of Diablo 3, which launched with horrible online functionality issues and restrictions, as well as a lackluster endgame, in 2012. Since then, it's expanded to consoles - which ditched its always-online DRM - and made a significant number of gameplay improvements. In other words, this entry in the series has been much more of a living service as opposed to a "buy it once and that's the version you get" product. And if that means getting to experience a new twist on an old favorite, I'm okay with that.